Forrás: NBC. Szerző: Melissa Dahl. Hope you’re ready to commit to the “temporary” tattoo you got at the beach on spring break. 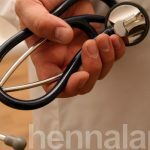 Some shops advertising “henna” tattoos actually use something called black henna, which may contain a chemical used in hair dye that can cause some dramatic skin reactions, the U.S. Food and Drug Administration advises consumers in a post published today. 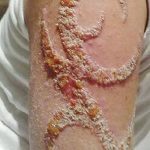 The FDA has received consumer reports of some long-lasting skin reactions after a black henna tattoo, including redness, blisters, “raised red weeping lesions” (yikes), loss of pigmentation, increased sensitivity to sunlight, and in some cases, permanent scarring. Your skin freak-out may happen right after the tattoo is applied, or up to two or three weeks later. The photos of reactions to the black henna can be striking. The FDA post shows an image of a group of friends showing off their temporary tattoos – the littlest hand in the group is that of a 5-year-old girl, whose skin severely reddened where the tattoo was applied. 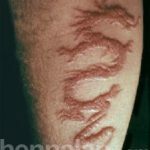 And in 2008, we wrote about a New England Journal of Medicine case study describing a 19-year-old woman whose skin bubbled up over the swirly tattoo pattern after she got a black henna tattoo at a wedding. A group of friends compare their temporary tattoos. The smallest hand (top right) belongs to a five-year-old who developed severe reddening where the tattoo was placed. A 5-year-old developed severe reddening where the tattoo was placed. Black henna, it’s important to note, is not actually henna, or at least not entirely. Traditional henna is reddish-brown in color, and is made from a flowering plant of the same name that grows in tropical and subtropical regions in Africa, southern Asia and parts of northern Australia. Real henna has been used for centuries to dye skin, hair or fingernails. “You may see ‘black henna’ used in places such as temporary tattoo kiosks at beaches, boardwalks, and other holiday destinations, as well as in some ethnic or specialty shops,” Ward says. “Depending on where you are, though, it’s possible no one is checking to make sure the artist is following safe practices or even knows what may be harmful to consumers.” That’s because not all states have laws or regulations overseeing temporary tattoos. One way to spot a shop that uses black henna: Adding the PPD makes the tattoo darker and longer-lasting. A real henna tattoo, on the other hand, fades to brown on the skin as it dries, and it will only last a few days — so be wary of a shop that advertises tattoos that last longer than that.